Before being eligible to donate blood or blood components, prospective donors must be tested to determine if they have adequate amounts of hemoglobin for their safety. The minimum qualification is 12.5 grams per deciliter (g/dL) and causes the majority of donor deferrals. One of the standard methods involves placing a drop of blood into a test tube of copper sulfate solution: if the drop of blood sinks to the bottom in an acceptable amount of time, the donor qualifies. If the drop of blood floats or takes too long to sink the donor is deferred. This article describes, for educational purposes, the steps involved in qualitatively testing blood for hemoglobin level using copper sulfate. 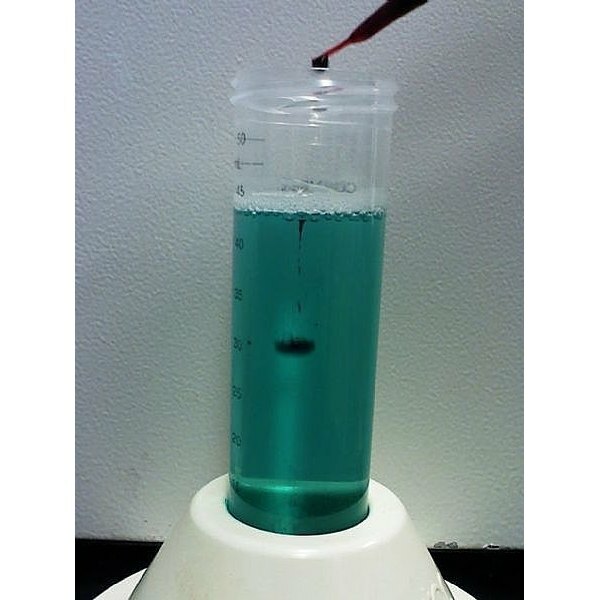 The copper sulfate solution is placed into a clear, several inch high test tube that is kept at room temperature and covered to prevent evaporation. A new tube is made daily or after 20-30 tests. A small amount blood is produced from the side of an alcohol swabbed finger using a lancet followed by pressure at the stick site. The blood drop is then drawn into a small capillary tube by capillary action. The finger prick site has gauze applied to it to stop any bleeding. A latex dropper bulb is then attached to the capillary tube containing the blood. The dropper bulb is squeezed slightly to expel a blood drop half an inch above the now opened copper sulfate test tube. The blood drop automatically forms a pellet upon contact with the copper sulfate. The used capillary tube is disposed of as biohazardous waste. The blood drop is observed for a short time to determine whether it sinks (donor hemoglobin above 12.5 g/dL cut-off) or swims (donor hemoglobin MAY be below 12.5 g/dL cut-off). Since the test is just an estimate, many false-negatives tests (hemoglobin is not <12.5 g/dL) are produced and hemoglobin may be checked in another more accurate manner. How the test works: the specific gravity of blood is directly proportional to the amount of hemoglobin it contains. Blood with a hemoglobin level of 12.5 g/dL has a specific gravity of 1.053 g/mL. Hence when a drop of blood is placed in a solution having specific gravity of 1.053 g/mL, it will sink if it has a higher specific gravity and thus greater than 12.5 g/dL hemoglobin and vice versa. The finger stick is the only accepted method of obtaining the blood for this method; while I myself preferred having my ear lobe pricked, research suggests that this site is unsuitable due to high result variability. There is minimal risk to the prospective donor for this test; the side effect are pain at the prick site. A hemoglobin of 12.5 g/dL corresponds to a 38% hematocrit (percent blood volume occupied by the red cells). This article is educational for donors who would like to know more about the blood donation process. This article is not for testing your own hemoglobin or for self-diagnosis of anemia. Take the recommendations of the blood donation center to heart (no pun intended) and see your doctor if you have any concerns with your health.